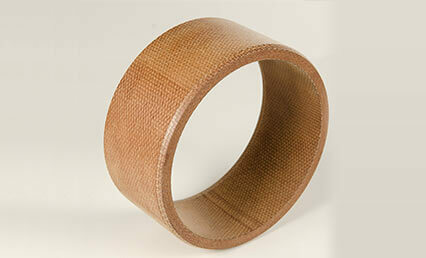 RAILKO RG1 and RG11 are based on a woven fabric bonded with resin. RAILKO RG1 and RG11 grades have the advantages of high temperature capability, high compressive strength, high pressure velocity, controlled friction, and low swell in fluids. The material is used as bushes, bearings, thrust washers, sliding pads. RAILKO RG1 – RAILKO RG11 are the same formulation. RAILKO RG1 is for flat products and RAILKO RG11 for cylindrical products. RAILKO RG1/RG11 is available in sheets and tubes. RAILKO RG1 is for flat products and RAILKO RG11 for cylindrical products.